A typical rehabilitation programme would look like this: Stage 1: First two weeks after surgery The objective is to reduce swelling, regain muscle control of your leg, restore your normal gait as well as the ability to extend and flex your knee. Your physiotherapist will use lots of ice and compression to reduce your swelling. You will be encouraged to exercise in short, regular bursts – say five to ten minutes every hour. Initially your physiotherapist will concentrate on getting you upright and weight bearing with support and trying to get you to walk without limping. It is important to be able to fully extend and lock your knee as soon as possible. This action helps the quadriceps muscle above the knee to pump blood away from the knee and reduce swelling. Exercises include hamstring and calf stretches, static contractions of quadriceps and gentle bending. Stage 2: Two to six weeks after surgery Now the objectives are to stop using crutches, gain confidence and strengthen the knee whilst restoring full flexion. Typical exercises will include stair climbing, static cycling, knee bends and lunges. Weights will be introduced and you may begin to swim but do not breast stroke until you are medically cleared to do so. Stage 3: Six to twelve weeks after surgery You will now be gaining in confidence and fitness and will have a regular programme to improve coordination and balance. The speed and resistance exercises will be increased; progressive hamstring and quadriceps strengthening will continue. Stage 4: Three to six months after surgery Now the objective is to maintain motivation, improve aerobic fitness and develop sport specific skills. Your programme will include progressive running and agility skills and a tailored sports programme. Jumping, running and rotating skills will be introduced. Stage 5: Six months onwards The objective is for you to return to a full level of activity at any chosen sport. Three to four months of sports training may be required before you are in condition to compete effectively. Naturally the above is only a guide and will be tailored by your physiotherapist to your progress and to the instructions that we give. RISKS ACL surgery is complicated by infection in less than 1% of cases. You will be given antibiotics to decrease that risk. If you notice fevers, increased pain or night sweat you should contact us. Blood clots are rarely see after ACL surgery. You will be given stockings to reduce that risk, If you are a smoker or on medication such as the combined oral contraceptive pill, you may be given blood thinning drugs to take after surgery, Please talk to Professor Haddad before your operation if you have concerns about possible risks. We hope the information provided has been of benefit to you. For further information please contact us on 0207 935 6083. After surgery your knee will be swollen and painful. Your physiotherapist will begin a rehabilitation programme immediately. Physiotherapists and surgeons are constantly improving their understanding of how best to rehabilitate knees which have undergone ACL reconstruction. Generally, rehabilitation programmes are getting faster so that almost immediately after the operation you will be asked to undertake mild exercise of the knee. By doing this your knee is prevented from becoming stiff which would prolong your rehabilitation. Of course, whilst your knee is still sore from the operation it is more painful to undertake rehabilitation exercises. This is one of the reasons we stress the importance of a good mental attitude. A small amount of effort on your part will be rewarded with superior results from your surgery. It is common after surgery to have swelling of the whole lower leg, extensive bruising and some numbness both around the scars and going down the inner side of the shin. These symptoms will gradually reduce over a few weeks although you may be left with a patch of numbness around the scars. This tendon connects your kneecap (patella) to your shin (tibia). About a third of the tendon is taken from the middle. The hamstrings connect the back of your thigh to your lower leg. These tendons are taken and woven together like a rope to form a new, strong ACL. The third option is an allograft – tissue taken from another person. 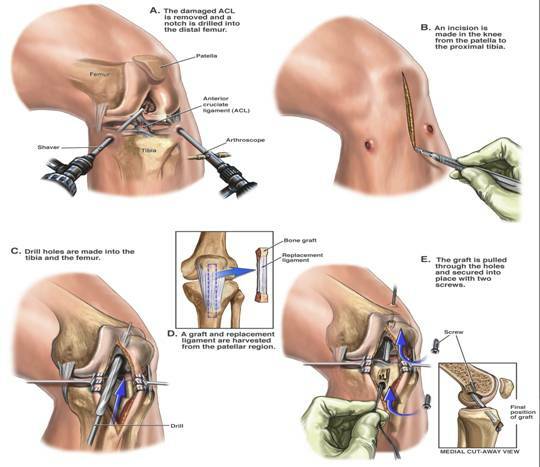 The advantage is that the surgeon does not have to disturb or remove any tissue from your knee. Non- surgical and surgical treatment choices are available. May be used because of a patient's age or overall low activity level. May be recommended if the overall stability of the knee seems good. Involves a treatment program of muscle strengthening, often with the use of a brace to provide stability. The choice is to reconstruct rather than repair the ACL as this gives better results. There are a number of ACL graft choices. These include either using the patellar tendon, your hamstring tendon, or using an allograft (taken from another person). The choice is usually tailored to your specific problem. In a typical ACL reconstruction, we drill a diagonal tunnel through the shin and thigh bones. Into this tunnel we insert the new ACL which will be fixed into place with small screws and similar devices. If you injure your ACL, you may not feel any pain immediately. However, you might hear a popping noise and feel your knee give out from under you. Within a few hours, the knee will swell, and you will feel pain when you try to stand. If you walk or run on an injured ACL, you can damage the cushioning cartilage in the knee. For example, you may plant the foot and turn the body to pivot, only to have the shinbone stay in place as the thighbone above it moves with the body.